*Like annual gifts, naming rights expire on July 31 -- the end of the fiscal year...but internet photos last forever. Chris ’08 and Ingrid ’07 Burrichter met at IWU and were drawn for this item. 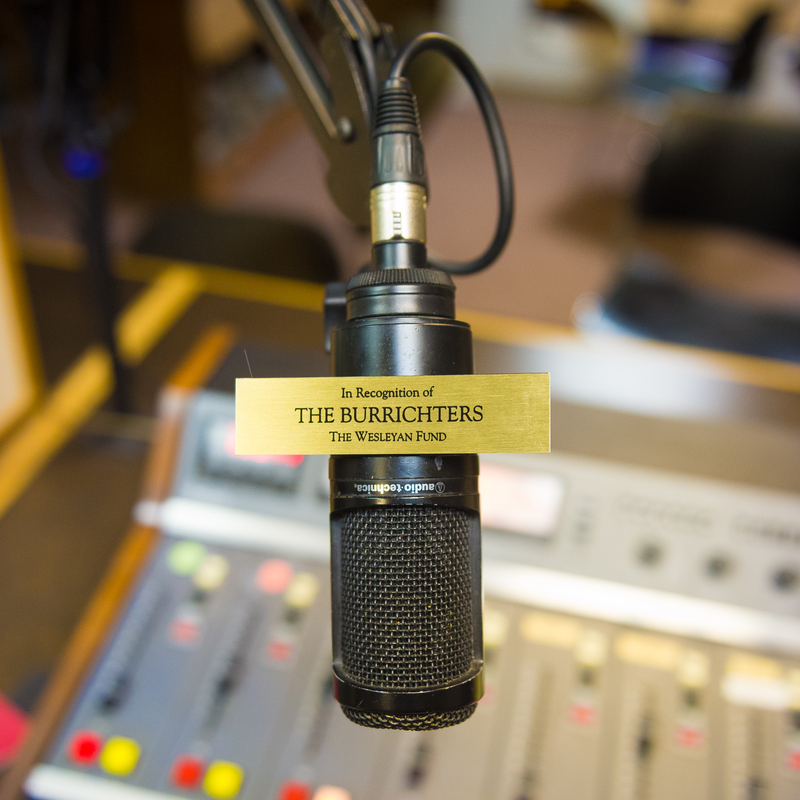 They chose to engrave “The Burrichters” to include Chris’s brother Doug ’15 who is a current DJ at WESN and father Steve ’70 who helped found WESN during his time on campus. The Burrichters have always had ties to IWU and WESN…and that’s especially clear today. Some of the best college memories, friendships, and relationships take root right here in the Bertholff Commons. 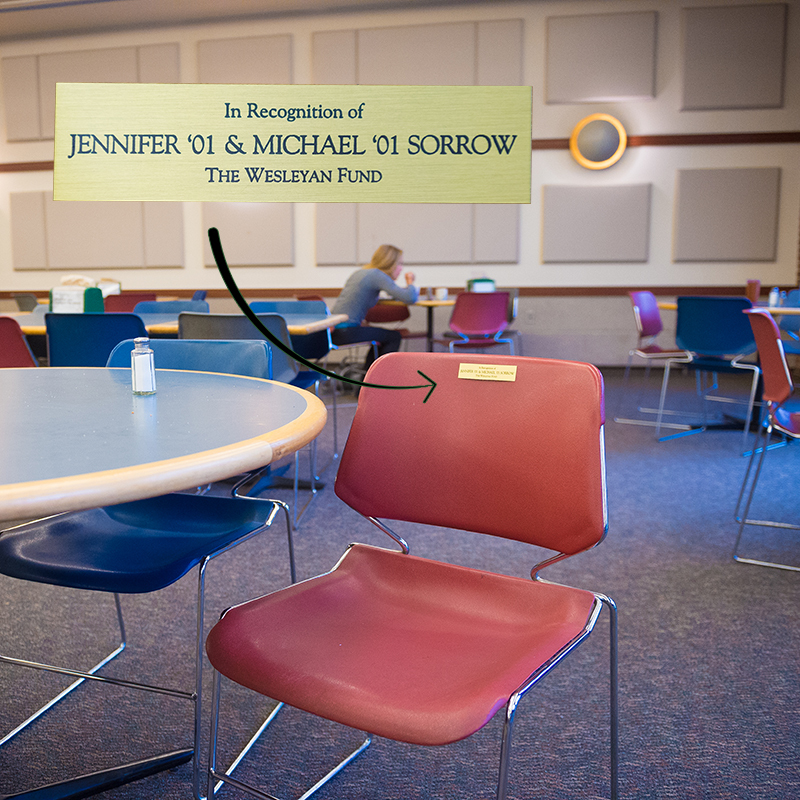 For the Titan who’s wondering if their crush is making eyes at them in the omelet line, let the Jennifer ’01 & Michael ’01 Sorrow chair serve as proof that casual conversation at Saga can lead to one of the few things in life that’s better than your chicken nuggets. While we still don’t know exactly what it is, we now know what to call it. 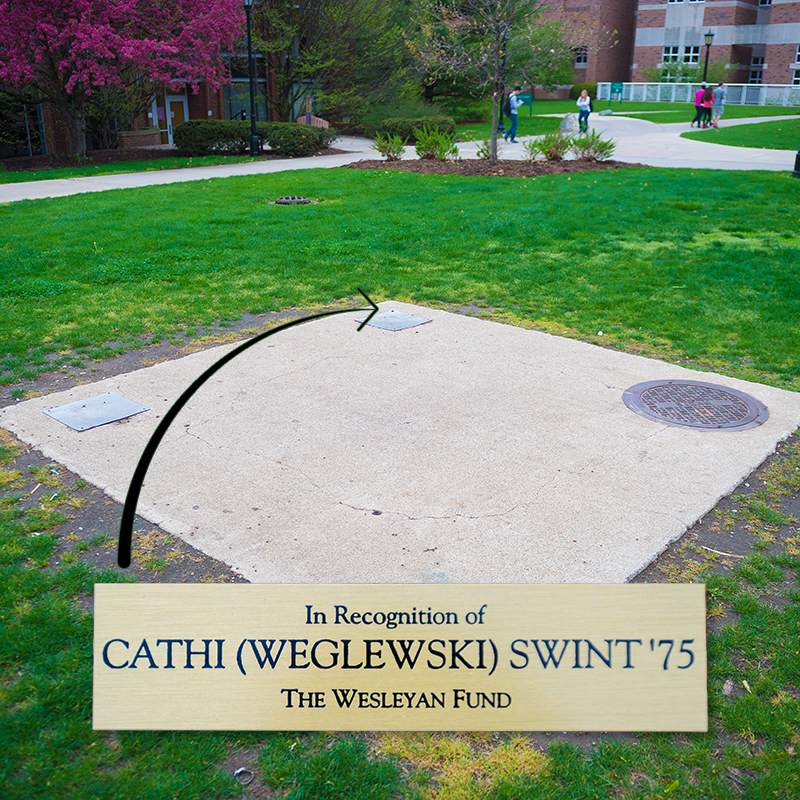 The Cathi (Weglewski) Swint ’75 Hot Spot will continue to provide students with the coziest slab of cement on campus. 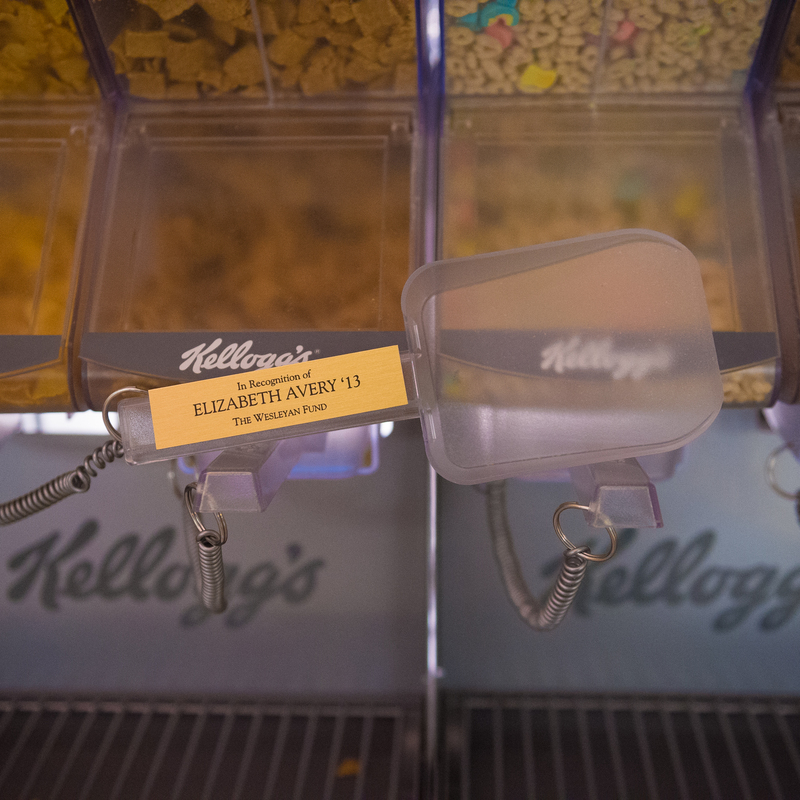 Cereal simply tastes better when scooped from a large bin. But cereal scooped with the Elizabeth Avery ’13 scoop is sweetened with generosity and is beyond comparison. Studying can be lonely, but comfort came along when bunk-bed technology was brought to cubicles at Buck Library. 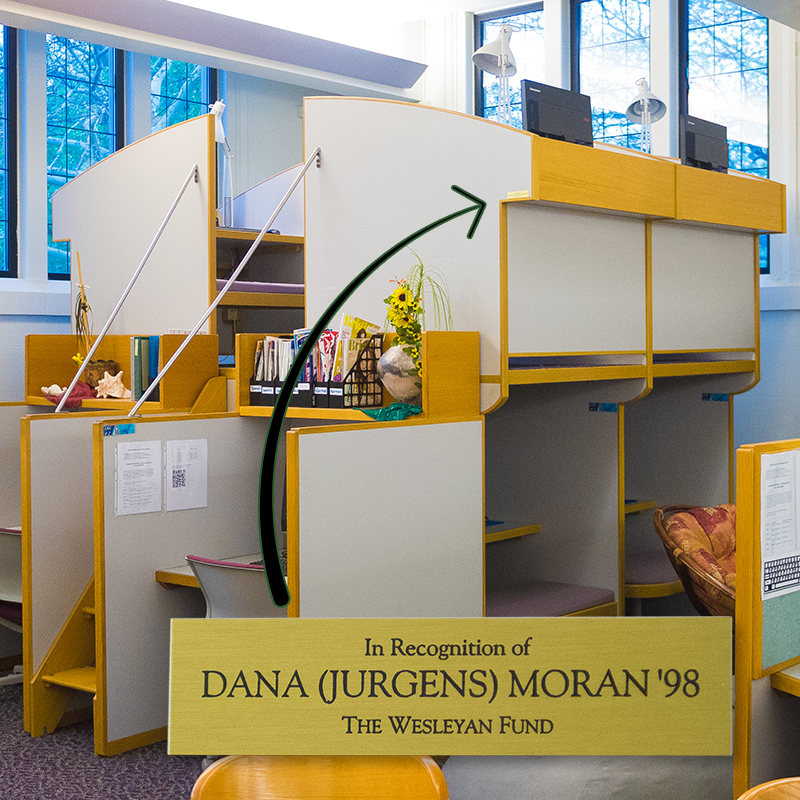 As students head into finals week, they’ll take comfort knowing that classmates above and below are sharing their pain…and students will now associate the camaraderie of stacked studying with Dana (Jurgens) Moran ’98. 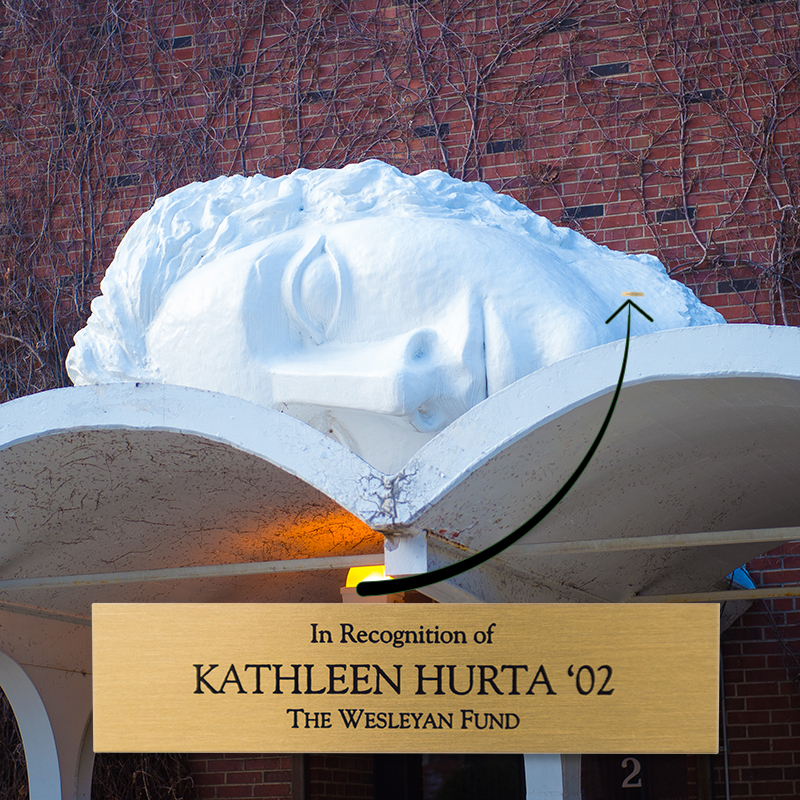 The next time you attend a production at the School of Theatre Arts give a shout out to Kathleen Hurta ’02, recipient of the Aphrodite Head naming right, and the many alumni and friends supporters of the phenomenal performances that serve as a launching pad for many Titans. Back in the day, football players walked through water and uphill both ways to get to and from practice. 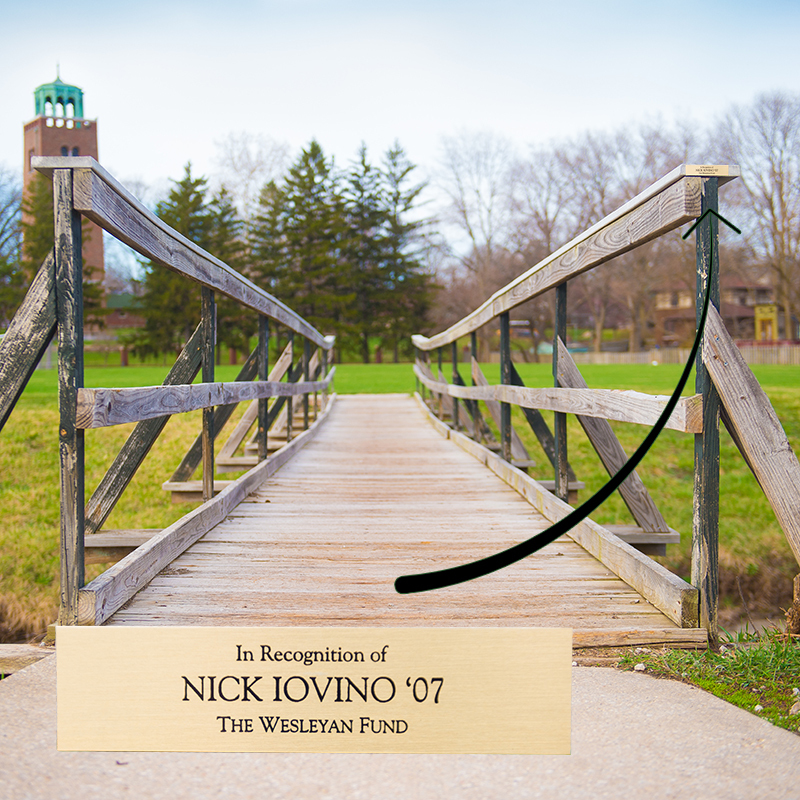 But thanks to donors like Nick Iovino ’07, Illinois Wesleyan continues to improve year after year. 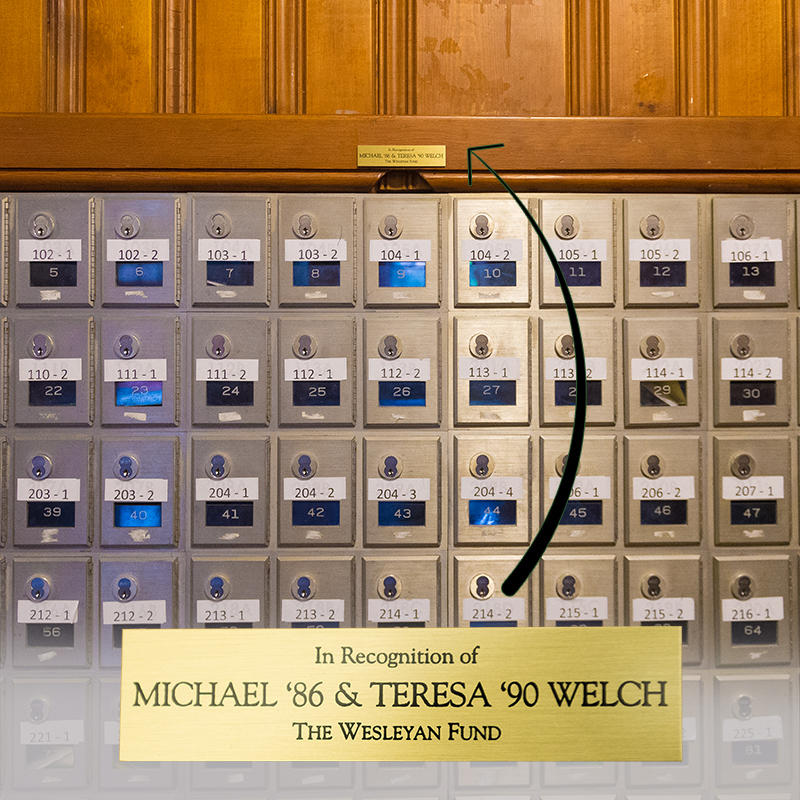 Michael ’86 & Teresa ’90 Welch are both IWU alumni and understand the excitement that comes in finding the “You’ve Got a Package!” slip in a college mailbox. Though they can’t take credit for the care package that arrives, they help remind us that donors play a role in every exciting moment on campus. Titans meet and exceed all challenges! 2,238 alumni and friends pulled together to raise $599,000 for IWU in one day! An anonymous donor matched the first $75,000 received! Titans unlocked $20,000 from Ed Phelps '62 after crossing the 750 gift threshold! Randy Reed '73 gave $50 for the next 500 gifts. An alumnus from the class of '74 matched $50,000 in gifts to close the day! Titans from around the world were All In For Wesleyan on April 9! The stairs/entrance on the side of the science building – This is where I became best friends with Alumnus Lyndsay O’Brien. We spent many mornings making the walk from Munsell to class in the science building. Lyndsay and I became best friends over the next four years playing soccer for the Titans, earning our nursing degrees, and talking late into the night on the stairs outside this building. She will always be such a huge influence in my life and a memory from Wesleyan I will never forget! Along with those stairs! Presser Hall Instrument Locker #178 – I stored my instruments and music in this locker for all four years I spent at Wesleyan. This locker was a constant for me, a place I always visited in the morning, and the place I returned to at night. Who knows how many thousands of times I opened it, whether it was to practice and study, or to make music with my professors and peers. This locker will always represent my time spent at Illinois Wesleyan, and all of the great people that were a part of my education. A chair outside Dr. Jaggi’s office – Each day during my junior and senior years, I would hurry down to the desk outside of Dr. Jaggi’s office to study for the MCAT or do class work. The atmosphere was a perfect concoction of good lighting, ample study space, and continuous encouragement from my favorite professor. I took great comfort in knowing that if I ran into a question while studying, Dr. Jaggi was only a few steps away and could help me work through it. Additionally, that study space was where I had some of the most meaningful conversations during my time at IWU – usually with professors or maintenance crew who passed by on the way to the vending machines! Pit couches in Presser – So many hours logged on those couches in between hours in the practice hallway… Those couches were therapy for the good, the bad, and the ugly…treatment for the blood, sweat, and tears…and a meeting place for the much-needed time to be a community. Shannon Wisecup’s desk – I would name Shannon’s desk in the Welcome Center, because it was my home away from home as a student and she was my “Campus Mom.” In general, the IWU Admissions office has been one of the most positively influential parts of my life. Ferguson 511 door – My 1st college dorm room. The beginning of an amazing 4 years at IWU. Cubicle in the second floor of Ames – There is a cubicle on the second floor of Ames Library that was one of my favorite places at IWU. Whether I was writing papers, studying for an exam, or organizing my to-do list, the cubicle in Ames always made me feel motivated and focused. The second-floor cubicle also helped me meet one of my best friends, who was sitting at the table on the second floor. During all of our late nights in the library, we spent most of our time sharing stories and laughing, planned a lot of California getaways, and always made time for a coffee break. When we come back for a reunion and to visit campus for the weekend, we always check on our cubicle and table and reminisce about all the memories in the second floor of Ames. To the students who are studying on the second floor of Ames right now — enjoy your time at IWU and good luck studying for your exams! One of the restroom stalls in the 3rd floor east bathroom in Pfeiffer Hall – I lived in Pfeiffer Hall from September 1968 to December 1971 and have a lot of great memories of the place. One of the more humorous (but necessary) directives to all residents was to yell “Showers” before we flushed the toilets to avoid scalding anyone taking a shower. Maybe the plumbing has been improved since then?? Back Pit of Presser – The Back Pit is where I spent a lot of my time. It’s where I wrote my first college paper and then ran to Ames minutes before it was due. It’s where Touch of Class would meet before rehearsals or gigs. It’s where I would wait during rehearsals, eat a quick lunch, have life talks, and so much more. Always loved running into professors and alumni walking through. Much better than the Pit! Stair step outside Saga – I was always focused on gaining knowledge and putting it to use, and IWU certainly helped me with that, but IWU also pleasantly surprised me by introducing me to my now-husband (Brian Trainor, class of 2007)! The first step on the eastern staircase leading up to Saga will always be special to me because that is where we first got to know each other. The big table in the sculpture shop – I spent countless hours at the table in the sculpture shop, sanding, sculpting with wax, waiting for plaster to dry or wax to melt, doing my homework from my education classes when my hands needed a break, having lots of great conversations, and listening to lots of loud music all the while. I got kicked out by security countless times and dreamed of a day the building would be open past midnight (or I could find way to trick security hahaha). More than any other place at IWU, (except maybe Hansen’s front desk) this was my place. A booth at Tommy’s – On any given day of the week, I could be found at Tommy’s. I grabbed lunch or dinner there regularly, met friends to hang out, or grabbed a corner booth and hunkered down to study. It was there that my love of waffle fries was firmly established, which lives on to this day. I loved Tommy’s. I don’t even know how many hours I spent there. Ames 4th floor study room table – As a nursing major, I spent countless hours in the study rooms on the fourth floor of Ames. I thought about having my mail forwarded there! Presser music stand – Although I wasn’t a music major, IWU gave me the opportunity to continue my passion for music while preparing for a career in political science. I met most of my friends through Titan Band, Jazz Lab and other ensembles, and had I gone to another school, I might not have had that same chance. I’d like to name a music stand because, just as I hauled music stands in and out of Presser Hall, IWU let me take my love for music with me to college. Die Cut Machine in ORL – Being an RA was the most transformative experience of my college career and has helped shape me into the student affairs professional that I am today. The support I received from professionals in Res Life and Student Affairs was and still is amazing. Ames Library Study Table, 4th floor southwest corner – This is a very unique place where I spent countless hours studying with my friends. It brings a lot of great memories back. I’d like my name on it :) This is the corner we’ve taken naps on the sofa chairs during finals or Sunday late nights when papers are due next day. Countless memories with great friends. Presser Hall Powdered Soap Dispenser – I don’t know why, but one of the restrooms at Presser Hall did not have the typical liquid hand soap dispenser that was found elsewhere on campus. Instead, it had this wonderful white, powdered soap that seemed more like laundry detergent than anything you should wash your hands with. Recent reports have indicated that said soap dispenser may no longer be in use, but it would be great to see this soap return for generations of music students to enjoy as part of the Renew Presser Hall campaign. The basement of Ames – This was my place to study. I hated going to other floors if the basement was full! Bridge to the old football practice field – We made a lot of great memories. This bridge was the starting place for practice, where I could stop focusing on school work for a little bit and focus on football, and it was the starting place to shed 100lbs off of my body and change my life and health forever. This is the place where the 2012 Titan football seniors practiced with our fallen comrade Andrew Weishar, and we were the last group to walk across this bridge to head out to practice before the turf was installed on Wilder Field at Tucci Stadium. Study table in Ames – The table on the second floor of Ames (in the corner, near the women’s restroom, by the window facing McPherson – I think it would be the southeast corner) was my home away from home. I lived there – friends would look for me there before looking for me in my dorm or house. Finding a table that has just the perfect combination of comfort, structure, good lighting, low distraction levels (but close enough to your friends’ favorite tables so that, when necessary, you are close to a good distraction) was not an easy task. But then I found it: the perfect table. Fortunately I found it pretty early and had my second floor Ames table for most of my IWU career. I researched deictic shifts there, I wrote reading journals about A Passage to India and White Teeth, I wrote papers about French cinema at that table. I also had long conversations about life, dreamed of plans after IWU, and laughed a lot with friends (quietly, of course), all at that table. My friends and I go back to sit at that table on the second floor of Ames to reminisce and have even more conversations about life. I’ve gone back to that table when I need to do serious thinking and planning and dreaming. My corner of Ames. I’ve always joked that that table should have my name on it, but even without my name, I will always think of it as my corner of Ames. The Cross Country Table in Saga – Like many sports teams, Greek houses, and student organizations, the IWU Cross Country team has a specific table that they sit at in the Bertholf Commons (more commonly known, still, as Saga). Like many freshmen, I was nervous about my foray into college life, and anticipating those first couple weeks of dinners sitting alone at the dining hall while still finding a niche of friends was the cause of much stress and anxiety. It was with great relief that, upon entering Saga for the first time, I found the entire Cross Country team huddled around two long tables, pushed together, laughing and chatting away. These were people who were still fairly new to me, but who nevertheless waved me over to sit with them, and it brought me immeasurable comfort to be able to sit down with people whom I could call friends, on my very first day of school. As the years progressed things changed. I moved from a dorm to an on-campus house, to my sorority house, to my senior year house. I joined different student organizations, and spent five months studying abroad in New Zealand. I gained friends, and lost friends, passed some classes and just barely passed others, and through the magic that is IWU, discovered not only the person that I was, but more of the person that I wanted to be. Through all of the trials and tumult that college inevitably brings, one constant in my time at IWU was that table in Saga. When I came back after five months abroad, I came right back to the table to find my team waiting, who automatically began to catch me up on everything that I missed while I was gone. After a bad day, there were always people at that table to boost my mood, and after a good day, there was always someone to share in my triumphs. We always ended practice with enough time to make it to Saga around 6:55/7pm, right before Saga closed. Because of this, the usual dinner crowd was gone, and we knew we’d have that table to ourself. On one hand, it was a very exclusive thing. Members of the student body who weren’t on the Cross Country team still knew that the Cross Country team sat there, and it was, admittedly, an imposing sight to see 40-odd people crowded around a couple tables. However, because of the nature of the members of the Cross Country team, it was inherently inclusive. While fiercely loyal to and defensive of their team and teammates, members of the Cross Country team are also involved in numerous other student organizations, are some of the highest ranking students on campus regarding their GPAs, and pride themselves in their involvement on campus and in the community. Because of this, the reach of my teammates extended, and continues to extend, beyond the team roster, and so when one sits down at the “Cross Country Table,” one always expects to see a new face, and meet a student from another organization. I met many of my closest friends from chance meetings at the Cross Country table, and am proud of my teammates for their inclusivity in the dining hall, which could be an otherwise scary place. I’ve since graduated, but my four years as a member of the Cross Country and Track team at IWU were decidedly marked by those two tables pushed together in Saga. It seems a silly and trivial thing, but as I thought about the “little things” that made my student experience what it was, I realized that the table I shared breakfast, lunch, and dinner with my best friends for four years wasn’t a little thing at all. In the end, it was a physical manifestation of where many of my life-long friendships cemented themselves, where I took a break from my day and shared a meal with strangers who became teammates, and teammates who became friends. As an alum, I know that each visit back to campus will find me at that table, sharing a meal with my former teammates, being welcomed back to the team as if I never left. A lot can be said about sharing a meal with your family, and that families who eat together are stronger and more involved, and I believe that was, and continues to be, an important aspect for the familial bonds that the IWU Cross Country team shares. The paper supply storage area in the CLA computer lab – When I was a senior, I spent a lot of time in the CLA lab studying (when we weren’t having movie night). I lost track of exactly how much paper I went through that year, but it was an incredibly large amount. Stack of papers on Dr. Charles Fruehling Springwood’s desk – Many an afternoon was spent with my fellow anthropology students around Dr. Springwood’s (Chuck’s) desk. I learned nearly as much in casual discussions with Chuck and my fellow students around his desk covered in mountains of papers as I did in my classes. He was always willing to spend extra time helping you hone in on a research idea or explaining how concepts from different anthropology seminars linked together. I truly believe a messy desk is an indicator of brilliance, and if that’s true, then Chuck is overflowing with it! The tomb-like stone things in front of Ames – Great place to just relax and watch the sky! Bike Fix-it Station Outside Hansen – (This is a great idea – way to go IWU!) The bike fix-it station was a gift that I made on behalf of The Tool Library right before leaving IWU in the fall of 2014. My intention was to have a placard of some sort installed near the station recognizing The Tool Library for its donation but that never happened. By putting The Tool Library’s name on it, you’d be recognizing two donors at once! I-House pool table – I spent many late evenings hanging out in the I-House lounge listening to the same songs on the radio (R. Kelly’s remix to Ignition and Matchbox 20’s Unwell basically played non stop those days) and playing pool. I play in the APA now and shooting pool to clear my mind in the I-House is one of my fondest memories of Wesleyan. The paint area at McPherson – The place where I have spent the most time is the paint area in McPherson Theatre. That is where I learned to mix colors, textures, and glazes. It is where I have done more paint samples than I can count. And those skills have given me the career I have today!! The shower heads on the pool deck, directly behind the diving board – I spent my entire IWU career as a member of the IWU diving team. Some of my favorite memories are with the members of my team standing under the showers encouraging each other, making each other laugh, or at times comforting each other during frustrating practices. Whenever I come back to support the current IWU divers, I smile at them standing under those showers, knowing that they too are making some wonderful memories. The Beauty and the Beast ladder in Ames – I’m #allinforwesleyan! I loved the time that I spent at IWU, and would have loved to swing around the circular reading room on the Beauty and the Beast ladder! 1st floor men’s bathroom in SFH – The bathrooms were probably the best part of the upgrade from Shaw to State Farm Hall my senior year. Practice room #9 in Presser Hall – Since I was a music education student who commuted from home, I spent many hours/meals/naps in the Pit of Presser Hall, and a lot of time in practice room #9! Couch in the Ames Second Floor Lounge – I didn’t have class on Tuesdays first semester junior year, so I made it my Ames day before my afternoon WESN shift. Inevitably, I would end up napping on a couch while trying to read content for Jim Simeone or April Schultz. Jim, April – I did all the reading eventually. I promise! I-House Staircase – I spent two years in the International House and loved that staircase! Computer 11, CNS E201 – The computer science majors at IWU can be a little… territorial. Since we have so many classes in the same room, CNS E201, we have become attached to “our” seats and “our” computers. Ever since I was in Dr Liffiton’s Algorithm Analysis and Design class, the front, right machine in the center block of computers has been “mine.” It had my back for over a third of my courses, my entire time with the ACM, and even my thesis defense for, “Elitist Schema Overlays: A Multi-Parent Genetic Operator.” Even as a graduate, I’ve snuck into E201 over homecoming to feel back at home. If I could name anything at IWU, it would be “my” old computer. The study room across from Dr. Harper’s office in CNS – I spent so. much. time. there! Fred Hoyt – Fred Hoyt had a profound impact on my time at IWU. For that, I would like to name him. Is that a thing? Can I do that? Hope so. Mailbox at Pfeiffer Hall – As a 1988 alum, who attended IWU in the days before email, Facebook and texting, I loved to receive mail. It was a lifeline to family, friends and boyfriends. A joy to look in at my mail slot and find it full of letters and cards. The chair outside Dr. Folse’s office – I was always in trouble with Dr. Folse and spent lots of time sitting in that chair waiting to see her. The McPherson Light Booth – Other great naming possibilities in McPherson would be: The Sound Booth; The Stage Managment Booth; The Box Office; Any Seat in the House; The “Rails” where the fly system is operated; The Orchestra Pit. The light booth would be my first choice because I was a Theatrical Design & Technology Major with a concentration in Lighting Design. I would also think that between Ben Sterrett and I, one of us would go after naming rights to the IT Service Center. The Sim Man in the School of Nursing – “Whatever you do in life, Do good” – President Minor Myers. The Shirk ice bath! – “Cherish the opportunity to compete” – Coach Shoe. Ames Library, third floor south side lounge couches – A lot of marathon group study sessions happened here.